The historical debate between Robert Aron and Robert O. Paxton on Vichy France, continues, by proxy, in current academia. While Aron argued that collaboration was forced on Vichy by the Nazis, Paxton maintains that collaboration was ‘a French proposal, that was ultimately rejected by Hitler’. These holistic views obfuscate the reality of power at Vichy. If we are to fully understand Vichy and its conflicting complications, we are required to deconstruct the regime into its constitutive parts and explore its internal incongruities, tensions and non-politically motivated instances of micro-resistance. A focus upon these micro-resistances highlights that despite toeing the party line, the press and the judiciary of Vichy were in fact, fighting behind the scenes to retain a modicum of independence vis-à-vis the Maréchal. When on June 14th 1939, the Nazi invasion reached Paris, the terminal Third Republic was given its coup-de-grace. Amongst the exodus, the Third Republic’s députés bestowed Pétain with full executive and legislative powers. With freedom of press and democracy abolished, Pétain sought to capitalise on the antiparliamentarian (and anti-republican) sentiment which had gripped France throughout the violent 1930s, and thus pursued what he considered political justice. This was not only in an effort to rid France of her ‘esprit de jouissance’ but also to establish a narrative of origin, a classic sign of a new regime looking to bolster its authority. Pétain’s answer was a show trial that would judge those ‘responsible for the passage from peacetime to wartime’. 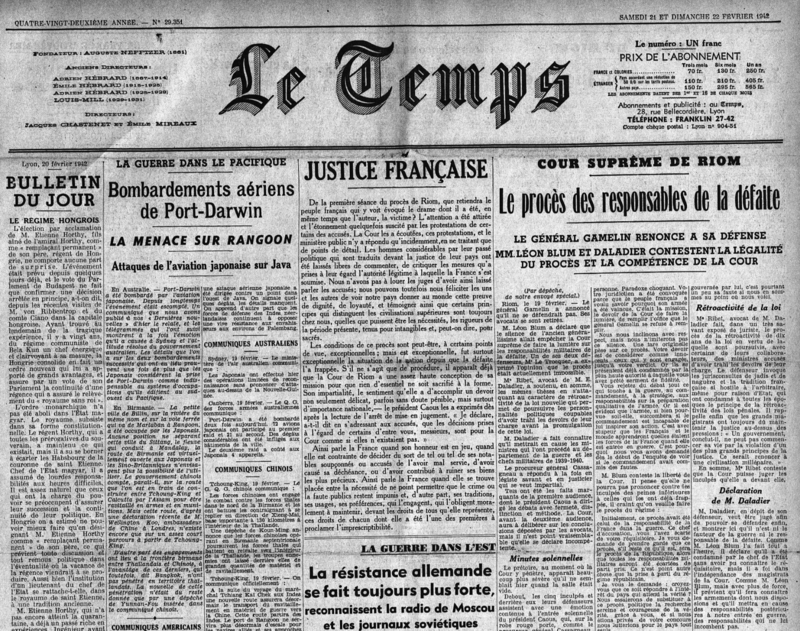 On September 3rd1940, Pétain promulgated a law which gave him the power to detain those who he, and he only, deemed “dangerous to the national defence and public security” and proceeded to arrest Edouard Daladier, Léon Blum, Paul Reynaud, Pierre Cot, Guy La Chambre, Maurice Gamelin, Robert Jacomet and Georges Mandel. Interestingly Radical député Camille Chautemps, thrice Prime Minister, did not figure on this list. He had supported Pétain’s rise to power and was away on ‘official business’ in Franco’s Spain. These men were to be tried at the then inexistent ‘Supreme Court of Justice’ which was created shortly after by Constitutional order, and was to sit in Riom. The men found themselves imprisoned by the Commander-in-Chief without defence or fair trial. Still not satisfied, Pétain took to the radio on October 16th 1941 to deliver the guilty verdict handed down by his Council for Political Justice; a group of close political allies who not daring contradict him, miraculously delivered a conclusive investigation on the defeat in a just few weeks. Pétain audaciously went on to claim he wished to respect the traditional separation of powers. He ordered that the Riom Trial go ahead, quickly. However, no semblance of a fair trial could be salvaged once the Head of State had declared the defendants guilty, twice, and forced all magistrates to swear allegiance to himself personally. On August 12th1941, Pétain took to the radio to tell the French of the new, mandatory oath of allegiance that all magistrates would swear to him. The judges of the Riom trial, tarnished by their forced allegiance to Pétain and their ex-post de facto condemnation found their hands tied, and their independence threatened. A large part of the trial was dedicated to attacking the illegality of the proceedings. Ultimately, by attacking the legality of the court, the defence was attacking the judge’s professional integrity, himself becoming entangled with Vichy’s illegality. The court was trapped by Vichy’s rules and regulations which constrained the debate. The only way that the court could impede the usurpation of its sovereignty was to give a large breadth to the defendants, allowing them to fairly defend themselves. Throughout the trial, despite being under strict instructions to impose ‘huis-clos’ (private hearing) whenever the Nazis, Vichy or other Axis powers were being besmirched, the judges allowed the defendants free reign to monologue for long periods of time. The judges wanted this to be a real trial to uphold the credibility of their establishment. Officially, they guided the courtroom debates according to the wishes of Pétain. However, behind this obedience is a resistance. Allowing the defendants to speak, often uninterrupted for thirty minutes, Pierre Caous was sending a statement. The judiciary in France cannot be overtaken by any regime. The press was no nicer to Vichy, publishing a plethora of tactful reproaches which combined to undermine the legitimate nature of the proceedings that Pétain attempted to puppet at all stages. Le Temps published extracts from the court such as the following, uttered by Léon Blum during the opening statements. 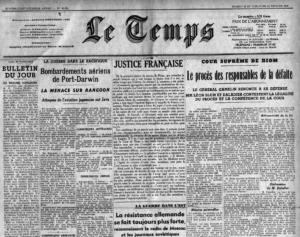 By 1942, Pétain’s popularity was declining, and the prosaic formulations published in Le Temps, of Blum and Daladier, coaxed democratic nostalgia which they were not afraid to utilise and the press were not afraid to publish, despite strict censorship. The proceedings were covered increasingly honestly, publishing extracts harmful to Pétain’s image. “Mr. President Pierre Caous: If you move on to another type of idea, I will ask you a question, but I do not want to tire you; I am not a torturer. Pétain’s propaganda team incessantly added to the extensive press censorship regulations, in an attempt to curb this rank insubordination by the supposedly Vichyist press. Nevertheless, the press in the Zone Libre wished to maintain the liberty that they had enjoyed during the Third Republic, the same liberty they had harnessed to attack it so harshly. Now, the same press served as a mouthpiece for the defence of the Third Republic itself, against Vichy. The trial of the Republic had become the trial of Vichy. The trial was quietly halted ‘to gather further information’ before being official closed sine die on this day, 21st May 1942. Binary and holistic approaches to Vichy will ultimately miss these elements of micro-resistance which elucidate the complex power/web of the Vichy Regime. We can conclude that two key institutions, the judiciary and the press did, at least in a small way, resist Pétain, be it largely epistemic but nevertheless existent. The labels of collabo and résistant are no longer sufficient to understand the complexities of power under Vichy. In a very Foucauldian manner where there was power, there was resistance. Daniel Baker is a student at the University of London Institute in Paris reading French Studies with History. His interests include Vichy France and the French right and his undergraduate dissertation examined the way in which ‘micro-resistances’ in the judiciary and press succeeded in undermining Pétain’s legitimacy and influence in France’s ‘Free Zone’. He will be pursuing a MA in Modern History at King’s College London from September 2018 where he will continue to build on his current research before going on to do a PhD.